Obtained by Michael at a recent collectors' fair. The original print is of excellent quality; on the back is written: 'July 4th 1914. 2.5pm up B'ham. 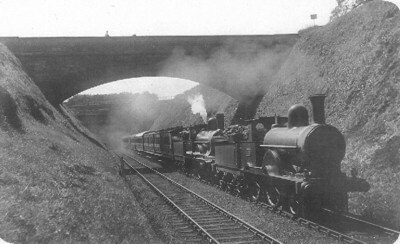 Engines 2190-1924'. So where is it? What about the stock? Who was the photographer? Any other information and comments? This looks like the east end of Beechwood tunnel, between Berkswell and Tile Hill on the Birmingham - Coventry section of the L&B main line. With hindsight it seems a sad date. Six days after Franz Ferdinand was assassinated at Sarajevo, with just a month of normal peacetime life left, before Britain embroiled herself in the Great War. Is this just to the north of Coventry? Is the southern portal of Beechwood Tunnel in the background? Historical maps indicate an overbridge as shown in the photograph. Tile Hill would be the next station. I've had it confirmed by Michael Musson (www.warwickshirerailways.com) who as a lad, used to live locally. His web site is well worth a visit and he's constantly updating it.